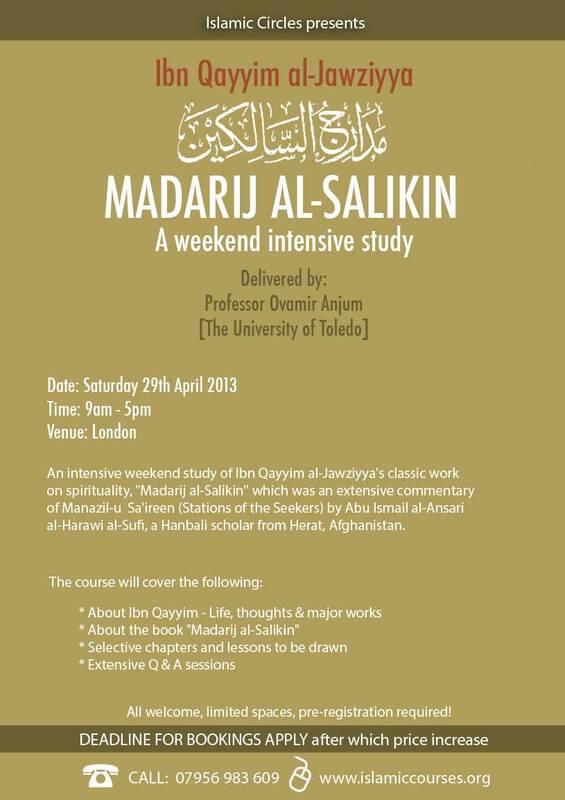 An intensive weekend study of Ibn Qayyim al-Jawziyya’s classic work on spirituality, “Madarij al-Salikin” which was an extensive commentary of Manazil-u Sa’ireen (Stations of the Seekers) by Abu Ismail al-Ansari al-Harawi al-Sufi, a Hanbali scholar from Herat, Afghanistan. This course will be based on the Madarij as-Salikeen is one of Ibn Qayyim al Jawziyya’s most well-known, and arguably his most developed spiritual work. The madarij is best understood as an expanded commentary on a terse Sufi classic, Manazil as-Sayireen, authored by the renowned Sufi master, Abu Ismail Abdullah al Harawi al Ansari. Widely read and admired, the Madarij is appreciated amongst contemporary Arabic readers for its piercing spiritual and psychological insight, literary charm and its potential to bridge the Sufi and Salafi divide. Introduction to Manazil al-Sairin and its author. It costs £50 / $80 (please that is a 12 hour video ) to watch and you have a month to view it.